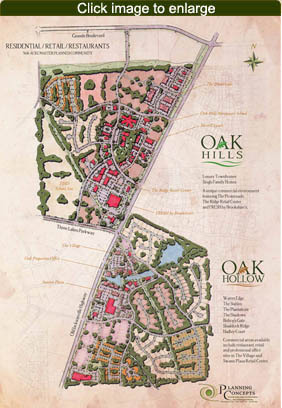 Oak Properties is home to Oak Hollow and Oak Hills. Both offer a new vision of living within the city limits of Tyler, Texas (pop.109,000), located 100 miles east of Dallas. The surrounding area (within 40-50 miles) services 800,000 people per day with Tyler's daytime population reaching 250,000. Oak Properties is bordered by four major arterial roadways, yet provides plenty of nature for residents. It’s also home to three major hospitals, The University of Texas at Tyler and Tyler Junior College. Tyler is known as the Rose Capital of the World, and features natural beauty from area lakes, golf courses and the Piney Woods of East Texas.